As a global engineering concern, the Honda name has long been synonymous with innovation and excellence across a range of industries. It was only natural, when they took the decision to expand into the garden machinery market, that they would apply the same rigorous design and quality control processes that has made their cars, bikes, and generators a byword for reliability. Over the past 45 years Honda mowers have developed an unrivalled reputation for build quality and longevity - many of their mowers still going strong after 20 years of service. The Izy HRG536VK is a 21 inch (53cm) self-propelled, multi-function lawnmower, driven by the impressive GCV160 four stroke engine with SMART drive® technology. The advanced auto-choke system prevents flooding ensuring that the HRG536VK really is easy to start in all weather conditions. The dynamic SMART drive® system offers variable forward speed which can be easily changed from the comfortable paddle switch conveniently situated on the mowers handle. By removing the necessity to manually push the mower the HRG536VK offers effortless operation at a speed to suit you - ensuring optimum cutting quality even when moving across uneven ground and slopes. For truly effortless mowing from start to finish you may wish to consider the electric start version of this mower; the HRG536VL. The HRG536VK is surprisingly light and agile for a machine of its size making it the ideal choice for medium to large sized gardens. With the addition of the simple folding handle the HRG536VK can be easily stored even in small sheds and can fit into the boot space of most cars with very little effort. Versatility is something Honda endeavours to offer with all of their lawn-care products and the Izy range is no exception. The HRG536VK offers the innovative Versamow™ feature allowing you to transition smoothly from the efficient cut and collect mode to the time-saving mulching mode. There are many benefits to using a mulching mower, if you want to find out more check out our Guide to Mulching. The main benefit for you is that mulching is up to 60% faster than collection mowing. Meanwhile your lawn benefits from the recycling of natural nutrients back into your lawn without the need for synthetic fertilisers. With six different cutting height settings from 28mm to 102mm coupled with the four-wheel independent height adjustment the HRG536VK can tackle longer grass with ease. Collection is aided by the inclusion of the generous 73 litre fine meshed grass bag which has been expertly designed to work in conjunction with the cutting deck to maximise airflow whilst effectively containing dust and fine particles ensuring both comfort and efficiency. The cutting deck is reassuringly robust having been produced from shock resistant pressed steel which has undergone a special anti-corrosive electrophoresis treatment – this treatment increases the deck’s resistance to UV rays and deterioration from corrosion. Durability is further ensured through Honda’s innovative design of the cutting blades which have been designed to bend rather than break in the event that an obstacle is hit. This greatly reduces the likelihood of damage to the machine should such an incident occur. 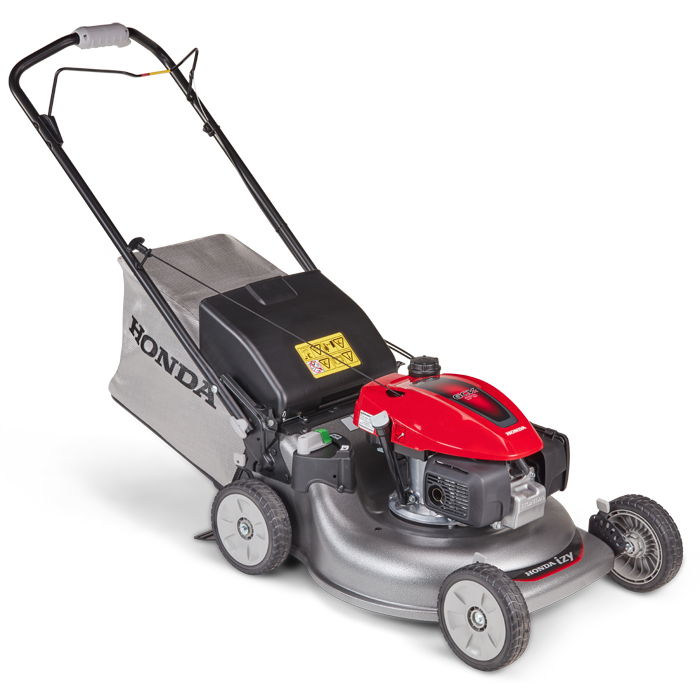 With the inclusion of a 5 year domestic warranty you can rest assured that Honda are confident that their mowers will provide many years of dependable service. Click here for Honda warranty T&Cs. More Power - Honda engines have high performance, top fuel-efficiency and very low maintenance. These engines are perfect for IZY lawnmowers and with a recoil grip made from a soft material they are so easy to start. Complex gardens, where you need maximum manoeuvrability without sacrificing power, are managed with minimum effort. SMART Drive - Precise ground speed control with a thumb/palm operated adjustable SMART Drive lever. Improved recoil grip - Soft material for a comfortable and easy start. High air flow grass bag - Specific R&D design to maximise the air flow going through the grass bag for improved collecting performance, with a fine mesh to contain any dust. Smart Blade Material - Designed to twist rather than break on hitting an obtacle, the smart blade means lower running costs and longer life. Pressed steel cutter deck - Resistant to shock and cataphoresis treated, to prevent rust, UV abrasion and corrosion. painted in an ecological powder painting process. Auto Choke - All of our products are powered by world class Honda engines so you can be assured of reliable starting and low maintenance. All of our lawnmowers run on unleaded petrol. Low noise - Our R&D team have designed a patented low noise blade (-0.5dB(A)) compared to traditional blades. With a combination of engine and cutter deck design, its noise level is 30% under the current EU standard. Versamow™ selective mulching - With a single lever, Honda’s Versamow™ system will either collect the grass cuttings into the bag or finely shred and blow them down into the lawn to create a natural fertiliser.